An excellent and delightfully fresh cup of single-serve coffee starts with the Hario Coffee Dripper V60. 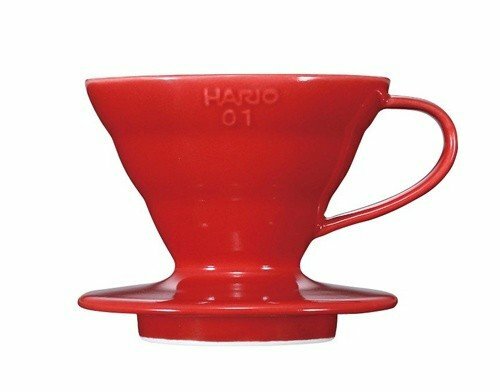 Crafted in sleek red ceramic, Hario intended this pour over for brewing one cup of coffee or, depending on the size you select, several cups at a time to share with friends. The pour-over technique allows you to brew directly into your cup or server. While techniques may vary among users, below is an overview of the pour-over's general process. Great Build Quality - The Hario Coffee Dripper V60 is designed with utmost quality. Ceramic drippers are extremely durable and maintain the best heat transfer, resulting in a hotter beverage. Hand wash as needed with hot water and soap.